PDF to Word Free lets you quickly and easily convert PDF files to Microsoft Word document, and preserves original formatting well. So you can easily edit or reuse PDF data in Microsoft Word! Support native PDF with multi-column, graphics, formatting, tables, and preserve everything as accurate as possible in Microsoft Word. Let you import and convert multiple PDF files at one time. Or simply convert any particular pages (for example, 1,5-10,12 or all pages) to save your time. It takes only 3 steps to convert a PDF to Word. Built-in PDF Reader is a good way to view a batch of PDFs within the app. You can mark table area, add columns and rows, merge and split cells, so it can handle the most complex table data conversion. - Support PDFs in multi-language, English, German, French, Italian, Portuguese, Spanish, Russian, Chinese and most of the languages around the globe. - Output .docx, .doc, .txt format. Support Microsoft Office 2004/2008/2011. Work smarter and more efficient with PDF to Word Free! 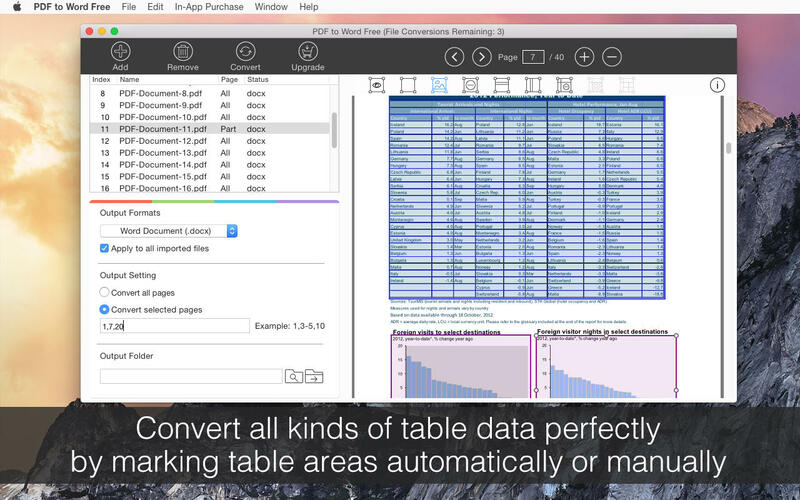 You don’t need to retype or copy-paste data from PDF to Word anymore! This is a free version, which can only output 3 pages for each PDF file. If your PDF has more than 3 pages, please purchase full version via in-app purchase. You can also add more output formats. If your PDF is not a scanned document, it can output fully editable Word document.